Last Week: Close. I was really only right for Sunday. Wind was strong enough for a good ride from Muskegon and north. However, Friday and Saturday didn’t pan out like I thought. The wind actually dropped on Friday afternoon instead of continuing to build like I thought it might. Then on Saturday, there was enough of light south wind to ride in Muskegon and further north. Today: There is wind out of the S right now and should keep blowing for another couple hours. However the lower half of the lakeshore is already experiencing dense clouds and some rain with more rain expected. The north half of the lakeshore would be good right now though. Specifically the Frankfort to Pt Betsie area. Saturday: The wind is going to switch and be out of the north Saturday. I think the best conditions will be from late morning through the afternoon along the northern half of the lakeshore. 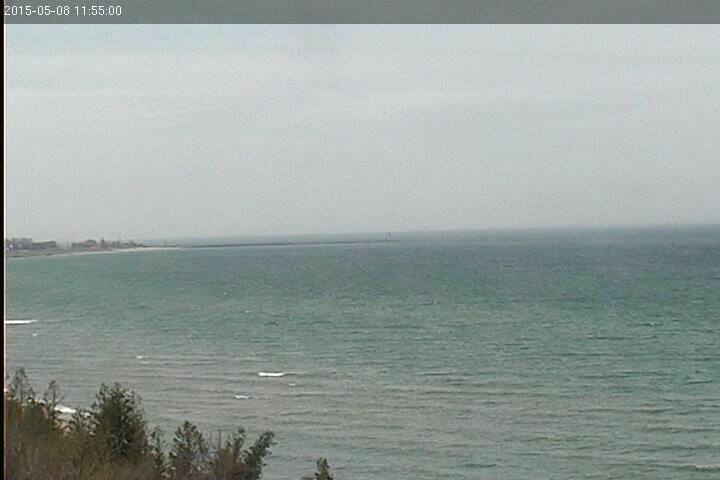 Manistee should have wind out of the north in the 20 knot range. There will be some NNW wind from Muskegon to Holland but since there isn’t much sun forecasted, I don’t think it is going to build over 15 knots. Sunday: Mothers Day: No need to skip out on mom to kiteboard today. Wind is going to be on the lighter side and out of the east. I finally got into a lighter weight wetsuit last weekend and didn’t get cold even. Things are improving temperature wise. Also, I’m trying to learn how to jibe on my surfboard. Any tips? I taught myself to gybe a surfboard by doing two things. On KiteForum I see the first piece of advice is general, but the second is not (because it can lead to doing the two-step instead of hop gybes). So, first is remove the footstraps if you have them and go strapless. This has all sorts of advantages, like freeing you to put your feet where they are comfortable, and making for a much more pleasant ride. For gybing it makes it much easier not tripping over straps or worrying about getting your feet back into them. Once you master gybing, it is relatively easy to go back to straps on high-wind and/or large-wave days. Second, I learned a bit just riding, but did best doing a long downwinder out in Cape Hatteras in the sound with relatively flat water and medium winds and a reasonably large kite. I worked on standing on the board around the middle with my feet next to each other and doing gentle S-turns without moving my feet. Once comfortable with this a simple gybe involves moving your front foot back a little, bringing your back foot up to match it, doing the turn, and then moving your feet the other way to the new side. This is a four-step gybe. It fairly easily matures into a two-step gybe, but I’ve found it hard to get from there to a one-step or hop gybe, so some recommend trying to go straight to hopping. I was either too old, too fat, or too impatient for that, and probably all three! Many posters say one ends up switching feet before the gybe on one tack and after the gybe on the other tack, and I can see that, but I’ve spent a lot of effort to be able to do either on either tack. Good luck, it’s a lot of fun. Hugh, thanks for the feedback and motivation! I got out yesterday and was able to practice gybing. After falling about 20 more times, I finally awkwardly completed a gybe. What helped was moving my feet close together before attempting to switch and adding a small hop. I have been riding strapless as well. Thanks again for the response.